I’ve seen a few complaints on social media over the past month from fat bikers about their favorite snow route being “post-holed” by hikers/runners. This is something I want to talk about today. Post-Holing occurs when a hiker/runner/animal travels on an otherwise smooth, packed-down snow trail. Each footprint leaves a hole in the snow. These holes make for a bumpy bike ride (as you might imagine), especially after they freeze and become ice-hard. The photo below shows a fairly smooth/packed trail on the left and a somewhat post-holed trail on the right. This is pretty mellow as post-holing goes. 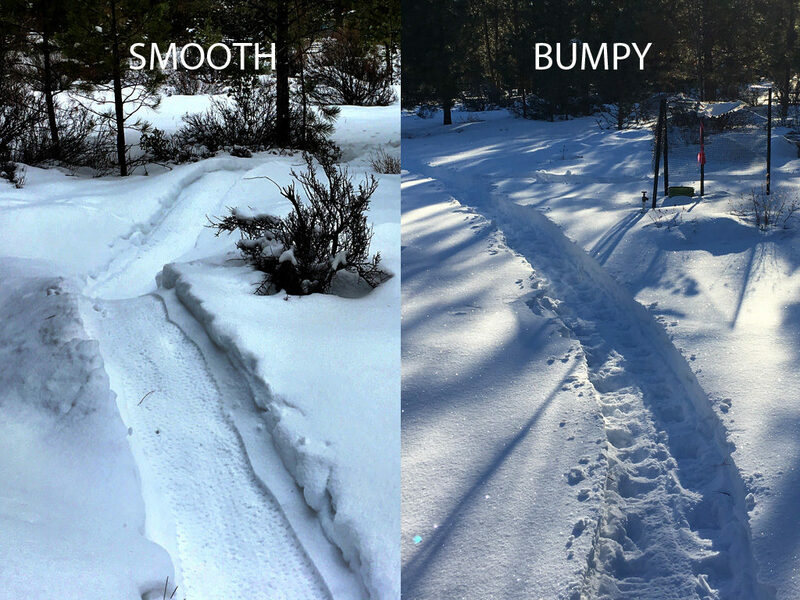 Someone recently asked BendTrails to educate hikers/runners on the damage they are doing to the packed-down trails when they don’t use snowshoes – maybe even work with the USFS to address the problem. We heard about some runners with dogs who ran on Ben’s trail after an individual spent two days packing it down with snow shoes. Naturally, the runners left holes, which unfortunately don’t go away until the next big snow storm. I will give some best practices for all users below, but it’s important to note that Phil’s, Maston, DRT, and Horse Butte are all Close-in, Multi-Use trails which are used year-round by all: hikers, skiers, snowshoers, animals and most recently, fat bikers. None of these trails are official winter trails, and as such there are no rules or regulations on use to my knowledge. It would be great if these trails stayed consistently packed and smooth for biking, but with a trail that’s open to everyone, that’s just not going to be the case very often. What’s even worse than post-holing is a tire rut which freezes and becomes rock solid. Many fat bikers aren’t able to ride early morning and end up going out in the afternoon when their tires are sinking into the soft snow more than 1″. This rut freezes overnight and makes riding extremely challenging the next day. Even that same afternoon it’s hard to ride a trail with a rut that your tire always wants to fall into. Many fat bikers like to ride snowshoe routes as an alternative to Wanoga and other multi-use areas. Snowshoe trails are a more challenging than Wanoga and feel a bit more like traditional singletrack. Characteristics include windy routes, tight corners, steep ups and downs, and constant tree avoidance techniques. Typical speed will be maybe 5 mph, which is 2-3 times slower than riding a wanoga groomed trail. Is a fat biker riding a snowshoe trail the same as a snowshoer walking a fatbike trail? If you are a fat biker and are riding a snowshoe trail, please yield to all others. These trails are made for and by Snowshoers . Bikers are allowed to ride them, and due to the slow nature of fat biking on these trails conflicts are rare. That’s not to say all snowshoers are happy about seeing bikers on the trails. Do your best to stay friendly if you are confronted on the trail. I have noticed people at times mentioning negative interactions with certain hikers on snow shoe trails and the bikers are pretty bummed and confounded by this. It’s not that confusing for me. These trails were not designed for bikers, and bikers could not even ride them if snowshoers had not packed down the trail. Is a fat biker riding a snowshoe trail the same as a snowshoer hiking a fatbike trail? Both are technically allowed despite the trail being designed for one specific purpose. Just keep some things in mind when riding on snowshoe trails. If you create a track in fresh powder on your bike, on a multi-use trail, does your track annoy a skier who was planning on skiing that trail? It’s probably a little frustrating, right? Think about that as you ride these multi-use trails. Other users are affected by our use as well. As a fat biker myself, I appreciate the work that it takes to pack down a trail. I’ve been there many times. But it’s important to realize that, if you are not on an official fat bike trail or an official winter trail, all bets are off. Other users will use the trail as they see fit and your smooth trail will be no more. If you like packing down trails for fat bike use, I suggest working on trails that aren’t used by hikers. Several people have been working on packing down Lower Whoops this month and that is not very likely to get any hiker use. Head up to higher trails and stake out some new territory! If you want daily reports on fat bike conditions, follow the Central Oregon Fatbikes group on Facebook. Conditions change hourly! Please update trails as you pack them down here on BendTrails and others can see what’s riding well. Set trails to “choppy snow” when they are post-holed, rutted or just plain messy. Please note that the Snow Bike trails at Wanoga should not be used by hikers or runners. 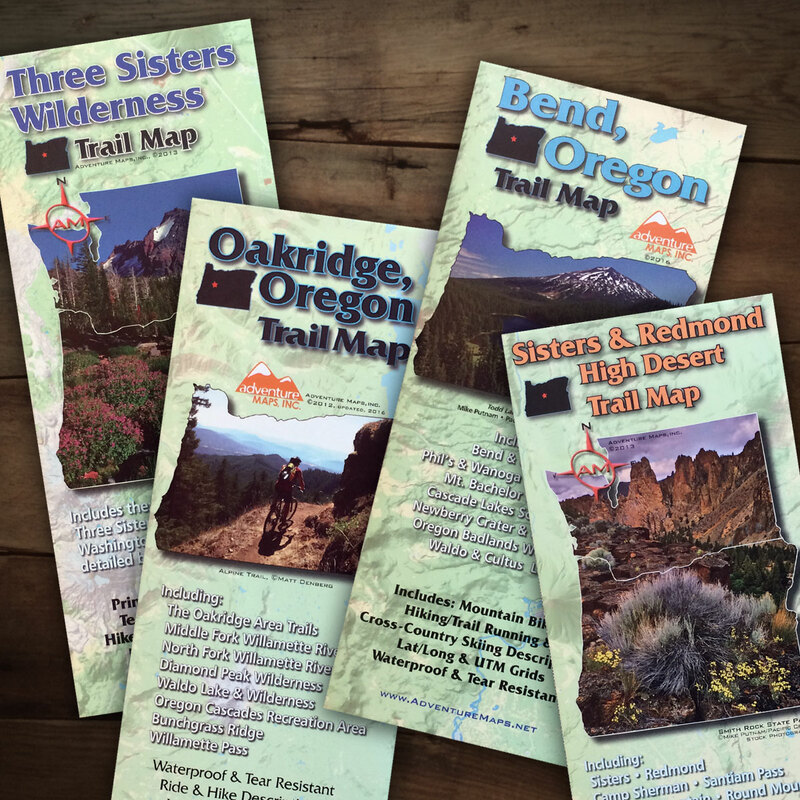 If you see someone hiking on one of these trails, please kindly explain the situation to them – that’s the best you can do! If you are a hiker or trail runner and have no snowshoes, consider using the trail in the early morning, when the snow is solid and frozen. Avoid official winter trails if you don’t have snowshoes, skis or wide tires or if you are sinking in the snow more than 1″. If you are a biker, it’s best to ride early as well, so that you are not leaving a rut which will freeze overnight. Also, drop your tire pressure to about 5psi (less pressure will give you better traction and leave a shallower rut). If you come upon a multi-use trail and find ski tracks, consider riding/running/hiking somewhere else. You were beaten to the punch! Chime in below with your views and opinions.